Cincinnati Reds first baseman Joey Votto was not in the lineup today leading to speculation that he may be headed back to the disabled list with the same injury that put him there there the first time earlier this season, a left quad problem. He’s 1-for-his-last-11 and 6-for-37 over his last 11 games. In 23 games since his return from the DL, Votto is batting .250 with 11 RBIs. He hasn’t homered since May 10. 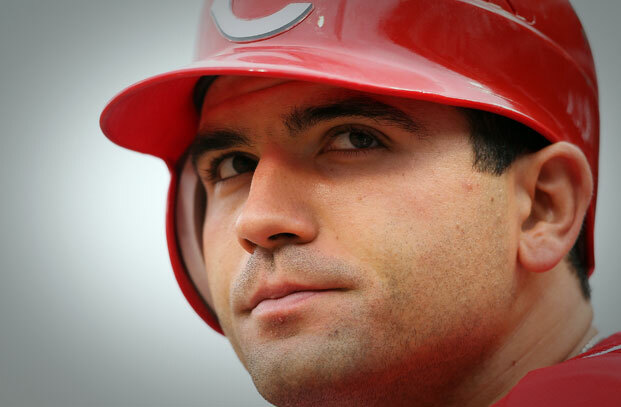 “For Joey, it’s just a day off,” Reds manager Bryan Price said. According to Ken Rosenthal at Fox Sports sources confirmed that Votto is indeed heading back to the DL. “We knew when he got him back from the disabled list that we weren’t going to be able to get him to 100 percent in the regular season,” Price said. “We decided to do some strengthening exercises and really worked on getting inflammation and soreness out of there. We accomplished that to a certain degree. But we knew we couldn’t get him to 100 percent. Sources: #Reds‘ Votto likely headed back to DL with same injury as before – strained left quad.